Castle Vardulon: Is there nothing that's not stupid about The Walking Dead? Is there nothing that's not stupid about The Walking Dead? 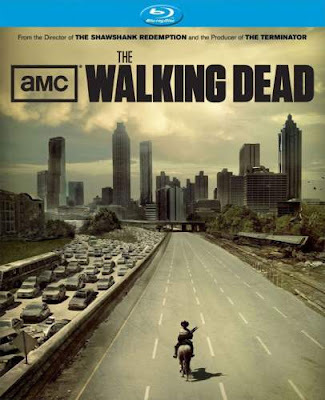 Here is the actual cover art for the first season DVD set of 'The Walking Dead', which, if I recall correctly, was also used as a promotional image. Does it really seem likely that staying on the correct side of the road is going to be a huge priority? Why not use the other side of the road? 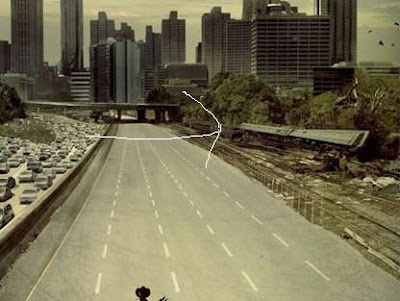 After all, it's not like there's anyone headed into Atlanta to get in their way. Also, not for nothing, but how did that train get derailed? Zombies? Cars swerving off the road, sure, I can get behind that. Zombies are scary, people crash cars over gophers. Not a stretch. But a train? It's on rails. And is heavy. And Zombies, as far as I can tell, are neither of those things. well,,,,, how about this. there was another gp38 locomotive on this stretch of track that wasn't supposed to be there. it was scheduled to be moved earlier that day but the engineer was was eaten. sure enough the other train comes along not knowing the situation in terms of the scale of the zombie outbreak or the fact there was a stopped loco on the tracks. there. now its your turn to use your imagination.